All the top shots from day three in the Bahamas as Henrik Stenson, Jon Rahm and Tony Finau battled for the lead while Alex Noren lit up the event with a hole-in-one. Henrik Stenson and Jon Rahm remained in a tie for the lead and were joined by Tony Finau after an entertaining third round of the Hero World Challenge. 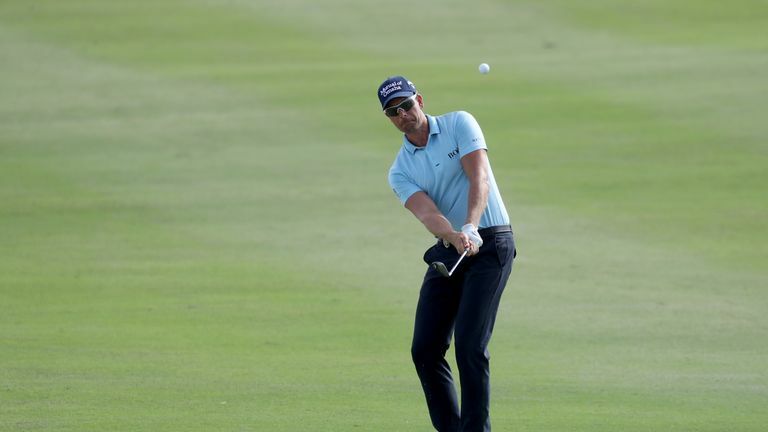 Stenson and Rahm shared the overnight lead and both fired three-under 69s on day three in the Bahamas to move to 13 under, while Finau recovered from an early bogey to card a 67 which earned him a share at the top of the leaderboard. Justin Rose is five shots off the pace and within striking distance of the runner-up place he needs to reclaim the world No 1 ranking from Brooks Koepka, while Alex Noren thrilled the fans with a hole-in-one at the 17th during a remarkable final five holes of his round. But Tiger Woods, who is hosting the tournament for the 20th year, props up the field after an error-strewn 72 and he will again be in the first group out alongside Hideki Matsuyama for the final round on Sunday, live on Sky Sports Golf from 4pm. Alex Noren made a hole-in-one during an amazing final five holes that featured two birdies, an eagle, an ace, and a triple-bogey! Finau atoned for an early mistake at the second with three birdies over the next four holes, and the big-hitting American capped an outward 33 with his fourth birdie of the front half at the ninth. The 29-year-old picked up further shots at 14 and 15 before pulling off a superb par save at the last to remain at 13 under, a score that proved enough to keep him in a tie for the lead after Stenson faltered down the stretch. The Swede spent much of Saturday in the outright lead after making four birdies on the front nine, but a tentative prod with the putter at the 13th saw him drop his first shot of the round. Stenson, who is without a win in 2018, clawed the stroke back at the long 15th only to bogey the next, and a par, par finish rounded off a 69 which was matched by playing-partner and Ryder Cup team-mate Rahm. The recently-engaged Spaniard hit back from a bogey at the second with three birdies before the turn and, after another blemish at 12, he picked up further shots at 14 and 15 and came within a whisker of dropping another birdie putt on the final green which would have given him the outright lead heading into Sunday's final round. The top trio have a two-stroke buffer over Gary Woodland (67), while Rickie Fowler was also five-under for the day after pitching in for an eagle-two at the 14th before adding birdies at 15 and 18 in his penultimate round as an under-30. Rose returned to his usual, steady self after not making a par over his last eight holes on Friday, and he followed a quiet level-par front-nine with four birdies in six holes from the 12th which enhanced his bid to top the world rankings for the fourth time since late September. The Englishman closed on eight under with Noren, whose astonishing run of holes down the stretch featured a birdie at 14, an eagle at 15, a triple-bogey seven at 16 followed by the perfect response - a pure nine-iron which found the bottom of the cup at the 181-yard 17th. The Swede, who came within inches of an ace at the 12th, added another birdie at the last to complete the most entertaining two-under 70 of his career, but it was another frustrating day for Woods as he continued to battle the effects of a bug he picked up shortly after "The Match" last week. Woods bogeyed the second and worse was to follow at the next when, after tugging his second left of the green at the par-five, he needed three attempts to reach the putting surface and eventually holed out for an ugly seven. The 42-year-old did manage to repair the damage with three birdies until slipping back again with bogeys at 12 and 14, although he birdied two of the next three holes to lift his spirits ahead of his final round of his successful comeback season.